For the last few weeks my very own, Swami Durgananda has been totally and completely absorbed in her June yoga teacher training program. In fact, she has been so engrossed in this work that I’m beginning to feel neglected. But she seems to be happy and has been doing all sorts of interesting things like painting, illustrating, writing, reading about yoga and the body and exploring meditative movements and emotion. In fact she’s been so absorbed with this new teacher training program starting at the Ashram that I am starting to feel a little abandoned. And a cat does not like to feel that way. A cat likes to feel fully loved and adored. Just the other night she was deep in illustrating the bones and fluid nature of the human spine. Of course, I have known about that forever because a cat’s spine is moving up and around and down and about a lot of the time. (In fact, I think every yoga studio and movement centre should have at least one cat to show the humans how to move properly!) I was surprised that she found this interesting and I became very curious about what she was doing. I tried, unsuccessfully, to gain access to the table where she was working, but Durgananda just shooed me away, several times, even though, with all my experience of spinal flexing and extension, I could have helped her. So, I gave up and nonchalantly sauntered off, swishing my tail and pretending not to be offended. I went to my favourite evening meditation spot, on the new cushions from India and settled down for one of my favourite meditation practices –shambhavi mudra. I kept one eye closed and rested into myself, reassuring myself that I was still lovable even though I was being ignored and unappreciated. I kept the other eye open and focused on the outer world, waiting for an opportune moment to once again investigate what Durgananda was doing. Finally, my patience paid off; she got up and left the room. I also got up and jumped on the table to take a look: there was a half-painted skeleton on a pristine sheet of paper. There was something curiously conscious about it all and the way the spine snaked its way up the body. I walked over the paper and had an instant thrill at its texture and the feeling in the air around it. It seemed to crackle with awareness. My need to participate in this activity deepened and I wondered if this was what Durgananda was talking about the other day when she said she had been exploring how the body is consciousness and through the practice of yoga we can not only become more conscious of the body, but we can experience the body as divine. My fur was feeling very divine and my spine twitched with excitement. I decided I would sit and meditate to see if I could absorb some of the knowledge from Durgananda’s painting. She said that by exploring our own anatomy we can become aware of the body’s innate wisdom and use this as a means to become more aligned with our inner Self. Durgananda ignored me and shooed me away again. 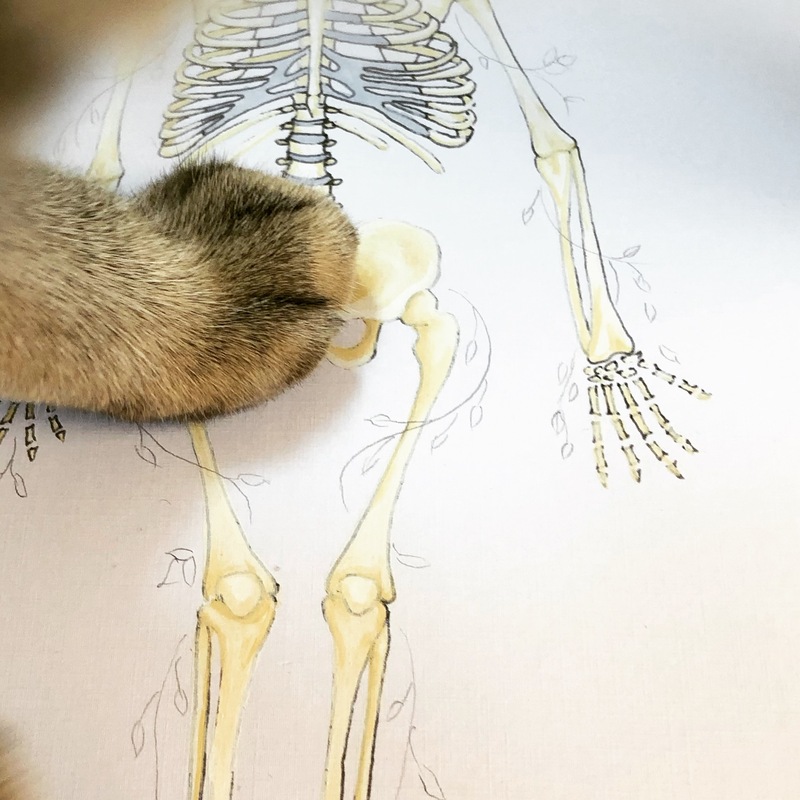 I took my time to decompress my spine by stretching out before elegantly stalking off and leaving behind my signature pawprint beside the skeleton. Unfortunately, I also got revolting muck, that’s called paint, all over my favourite meditation shawl, my own luscious fur. Feeling more aligned to my inner-self, and less petulant, I took a look over Natji’s shoulder and saw that he was reading some of Durgananda’s notes about how she became a yoga teacher. They looked very interesting, especially as I am hoping to become the first cat who has completed yoga teacher training with her. I decided to read them too and am surprised to find things about Durgananda that I did not know before, such as that she used not to talk at all, whereas my experience of her is that she talks a lot…. Becoming a yoga teacher has been a great sadhana (spiritual practice) for me. Over the years it has helped me connect with a feeling of grace. It’s actually quite odd that I’m a yoga teacher because I never had any intention or desire to become one. When I first moved into the ashram, around 22 years ago, I was very depressed and introverted. I was painfully shy and could barely speak and my life lacked meaning. I was filled with a sense of hopelessness and terrible despair. At the time, Devi Ma and Swami Bhaktananda were running the ashram’s yoga classes and I would attend. During class, and afterwards, I would momentarily feel better. The feeling of depression, this deadness that had lodged itself in my body, would lift a little. After each class I would feel slightly more alive. At some point Devi Ma said that I should become a yoga teacher as she thought it would help unblock my throat chakra and I would learn to communicate with others around me. I was quite shocked at the idea and thought it was awful, though (of course) I didn’t say that. Instead I just succumbed: nodded a bit, muttered “yes”, “maybe”, “OK”, “I guess so”, because its generally best to say yes to Devi Ma, especially when you are an ashramite. But my feelings were in revolt. I had at least a hundred reasons why this was a terrible idea; firstly, I really was too shy to speak; second, I didn’t want people looking at me; and most especially, I didn’t want a room full of people looking at me while I tried to talk with them! My list of tearing thoughts was endless. I went away to have a think: not about how I could overcome my tearing thoughts, but about how I could get out of the torture of becoming a yoga teacher. I decided that Swamiji would help me find a way and went to have a talk to him. Unfortunately for me, Swamiji also thought that becoming a yoga teacher was I good idea. Now I was really stuck. I was stuck because, when I first moved into the ashram, I had made a commitment to myself to do the program, whatever it was, rain, hail or shine, for one year and then re-assess how I felt to see if I was any happier. And it now seemed that my program had just become yoga teacher training! Very reluctantly, I began demonstrating postures in Devi Ma’s classes. In fact, I was so reluctant that, one time, I rather foolishly (and unsuccessfully) hid in my cupboard to avoid going to class. Teaching was initially very hard for me - I was having a lot of trouble regulating my inner world; my tearing thoughts were very strong; I would go up and down emotionally and I carried many years of pain in my body. I projected all sorts of concerns: how could I teach if I felt scared or had a big feeling? What if I was having a bad day? What if I was hiding in my room weeping and then had to come out and teach a class….? We had an unexpected, afternoon guest at the ashram. They stayed on and on and on. It was important for Devi Ma to remain there, even though the time for her Monday evening yoga class was getting closer and closer. Suddenly I had a terrifying thought that I would have to teach her class. And, one second later, Devi Ma turned to me and asked me to take the class. I nodded “yes”, but I had no idea how I was going to do this. I was terrified. But, even though I was really, really afraid, I did it. Devi Ma seemed to have faith in me and I figured that if she believed I could do it, then I must be able to do it. And to my surprise I did it. My voice shook. I probably spoke too quietly and maybe not as clearly as I might have. But I did it, and it felt good. I felt the Shakti support me. The people in the class were happy. In that moment, at the end of the class, I overcame some of my tearing thoughts. I discovered that just because I feel scared, doesn’t mean that I don’t do something. But the real moment I felt like a yoga teacher was on a cold wintery evening. I was on my way to teach at a gym; I didn’t really feel like going; I would rather have been curled up in bed with a cup of tea and a detective story. But I had committed to the class and I needed the money. On my way out, Swamiji came out of his room and asked me where I was going. I said, “To the gym to teach a yoga class”. He looked straight into my eyes and said, “You are a Yoga Acharya - a yoga teacher”. He smiled and told me to be one my way. Something magic happened in that moment, something so mysterious and so profound. I felt the Shakti and support of my lineage embrace me. The feeling was like a woosh inside me that then stabilized and filled me with joy. My mind seemed to open and I felt like I received a download of Swamiji’s yoga practice and that of all the sages of this lineage. A part of my awareness became alert to a completely new dimension of myself. I had a new possibility of how I could relate to the world, with confidence and supported by the grace and Shakti of this lineage.